Pianist Lang Lang, Folk singer Song Zuying, Cpop artist Jay Chou, and renowned Spanish opera singer Placido Domingo got together at the birds nest. Having read about the preparation work for weeks, and looking at the performance list, I can safely say that this concert was so much better organized than Jackie Chan’s concert, which seemed messy and thrown together. If I can find HQ videos of the performances I am definitely doing a post on this. Each and every performance meant something and showed off the variety of Chinese music. 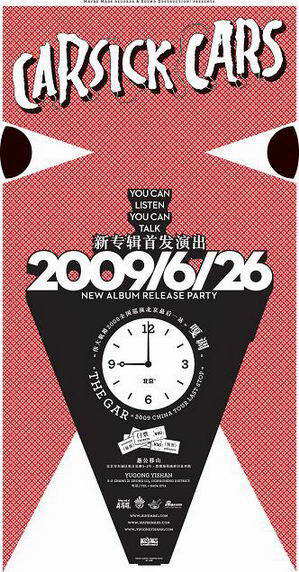 Carsick Cars releases their new album: You Can Listen You Can Talk . The I haven’t listened to the album yet though so I can’t tell if they’ve fallen into Sophmore slump territory. Theya had a release party at Yugong Yushan in Beijing to the delight of their fans who hadn’t seen them perform in months. Not only did they sing Zhong Nanhai and other songs of their own, but the Dj also put on Michael Jackson songs with the crowd singing along . A-mei Chang also released her album AMIT – Amei: Music is Transformed, with a new style. I like it a lot better than her last one. Listen to her album here. On her blog HK singer-songwriter G.E.M. Tang posted a new song All About You . Not written by her but she sounds gorgeous like always. She has been in America recording her first album. Jerry Yan releases MV “I Will Love You”. If the girl in the drawing @ 1:20 sec into the MV looks familiar, that’s because she’s Secret, Parking actress Gui Lun-mei. Although her face doesn’t actually appear in the MV besides that charcoal sketch, she was recently in a lengthy Walkman commercial with Jerry Yan that featured this song. 1983 group (two bald twins), sang their song Happy Zhu Bajie, at a festival in China in Chendu I believe. I lost the article link so the details of this are fuzzy. But I’m just glad they’re promoting this song, because it’s one of those fun goofy songs. They used to do ballads a lot, but I hope they go in this direction more. 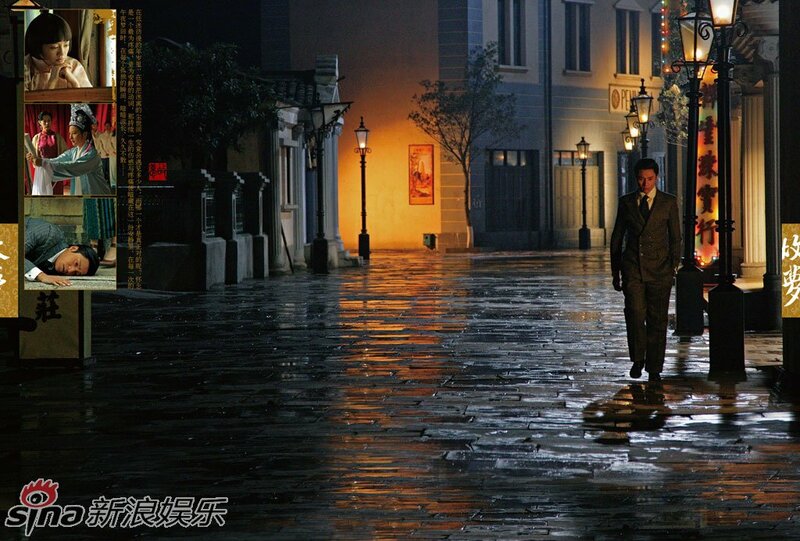 The so-called “large-scale” TV Drama Remembrance of Dreams Past with Chen Kun as the lead released its first set of HQ stills and the sets look great. Chen Kun plays the son of a princess in the time of the last emperor, and will play his character from age 18 to 90 from the Republic of China to the 70s as he travels in the story from Taiwan to Beijing, to Shanghai and then finally to the South. Another “large-scale” drama, The New Dream of the Red Chamber is so large that it’s “past caring about the money”. Its production cost has surpassed 200 million yuan (~30 million USD) , which is an absolutely ridiculous sum for a tv series and pretty much unrecoverable. I thought it had gone into post-production but it’s actually only a fifth of the way finished, and two hours of filming were shown on Beijing TV allowing for critique. It was said that Older Baoyu (Yang Yang) was very good, very professional, and didn’t seem as dull as in pictures (I have to agree with them on his dull look). Young Baoyu however seemed too crafty due to his eyes. The actor playing Young Baoyu (Yu Xiaotong) had also grown from 174 cm to 184 cm during the filming, giving them another cause for headache, and he had to squat down in many scenes because of his height. (L) I love it when actors I like team up unexpectedly together, which is the case here. Wilson Chen Bo-Lin and Wang Luodan will star in a romantic comedy, “Rules Before Dating” based off a hugely popular online novel. He said he’s seen Fen Dou/My Youth, and she first saw him in Blue Gate Crossing, praising him as someone who became a skills-based actor from an idol. (R) Ivy Chen’s Black and White has just finished airing, and she and Eddie Peng have just finished filming the non-profit film: “Ting Shuo” which is about a hearing impaired swimmer. This film sounds really sweet and definitely hope to see it soon. It comes out end of August. The trailer for On Her Majesty’s Secret Service, one of those wacky “Chinese Humor” movies starring Louis Koo and Barbie Hsu is out. I love these type of HK movies, so count me in for this as well, especially since I think both actors can act and will do well together. This entry was posted in Mainland China, Movies, Music, Taiwan, Television and tagged 1983 Group, Amei Chang, Carsick Cars, Chen Kun, Eddie Peng, G.E.M. Tang, gwei lun-mei, Ivy Chen, Jerry Yan, Meteor Shower, New Dream of the Red Chamber, Peng Tan, Remembrance of Dreams Past, Wang Luodan, Wilson Chen Bo-lin, Yang Yang, Yu Xiaotong by cfensi. Bookmark the permalink. guess what people i just got some new picture of meteor shower season two and omg yunhai he is even hotter than before…. Ooh, lotsa good stuff to look forward to, especially Remembrance of Dreams Past… and On Her Majesty’s Secret Service looks hilarious! do you think they took bad shots on purpose to get ppl talking? 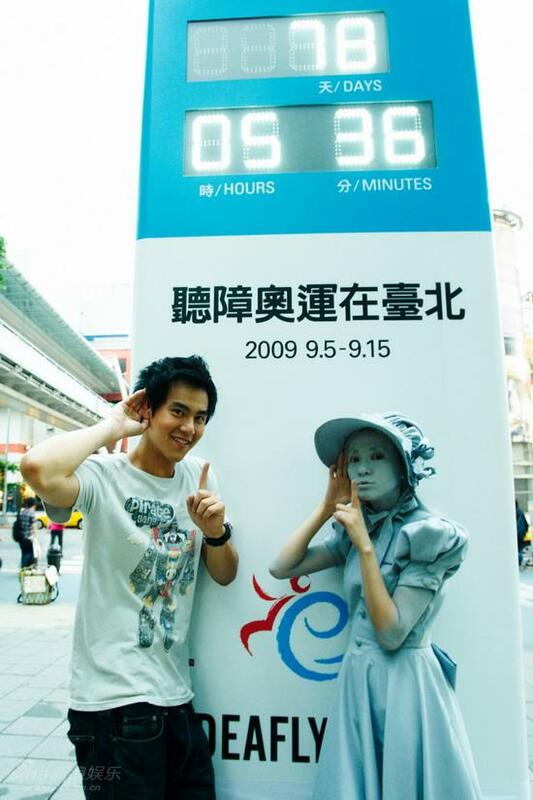 @yelei Yeah, I think even if Gao Xiaochen never ends up doing anything, at least I have that nice photoshoot of him. @julie Hey! But I don’t think the producers of Meteor Shower actually want to erase the resemblance to other versions. It’s free publicity at it’s finest. @megan I believe the date for the concert was June 30th. But don’t quote me on it.